(New Britain, Conn., March 6, 2018) – The New Britain Bees today announced the signings of infielders Deibinson Romero and Angelys Nina. Deibinson Romero will make his Atlantic League debut with the Bees during his 13th season of professional baseball. Last year, the infielder played in 72 games for Veracruz of the Mexican League, and collected a .268 batting average with six home runs, 36 RBI, and 29 runs scored. The 31-year-old began his professional career in 2006 within the Minnesota Twins organization. He spent nine years in the Twins farm system, reaching as high as the Triple-A level in both 2013 and 2014. This also included a two year stint playing in New Britain Stadium with the Rock Cats from 2011-12, where he posted career highs of 19 home runs and 78 RBI in 2012. The slugger also spent time with both the Pirates and Yankees organizations in 2015 and 2016, respectively. In 1,081 career minor league games, Romero owns a .263 batting average with 105 home runs, 584 RBI, 537 runs scored, and a .349 on-base percentage. 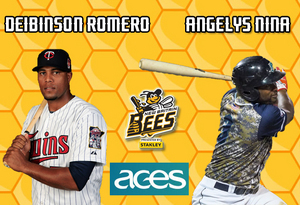 Angelys Nina joins the Bees during his 12th season of professional baseball and third in the Atlantic League. He spent the 2017 season with the Bridgeport Bluefish of the Atlantic League, playing in 77 games and collecting a .264 batting average with five home runs, 36 RBI, and 28 runs scored. The 29-year-old began his professional career in 2007 after being signed by the Colorado Rockies as an undrafted free agent. Nina spent nine years with the Rockies organization, before joining the Philadelphia Phillies club in 2016. He reached as high as the Triple-A level, playing there from 2014-2016. In 972 career minor league games, Angelys owns a .281 batting average with 52 home runs, 447 RBI, 439 runs scored, and 142 stolen bases.